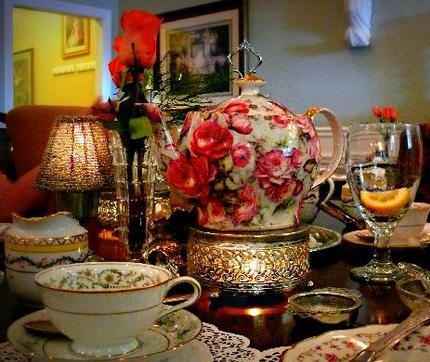 MORE ABOUT British Tea Room: The British Tea Room is an Oasis for the senses. The smell of fresh baked scones and petite desserts mingles with aromatic flavored teas. The crystal chandeliers highlight the eloquent decor that enchants the eyes. The palate is tantalized by tea sandwiches, warm rich soup, hearty sandwiches, fresh salads and quiche. The sound of relaxing music dances with the candle light that adorns the antique tables. All this makes for a new favorite lunch destination. Come alone and spoil yourself or gather the family and friends for making memories. Before you head back into the "real" world linger in our unique gift shop filled with treasures and treats. Purchase loose leaf teas to enjoy at home. Stop in and ask for a copy of our News Letter, "The Sugar Cube Press" to find out about special discounts. Open seven days a week. Reservations recommended Monday thru Saturday. Sunday strictly by reservation. Open Sundays starting in September!